Living on a student budget isn’t always fun. You may not always have the time to pop into Portswood for a takeaway or Costa for a quick coffee fix and in the few days before your student loan comes in, you almost certainly won’t be able to spare the cash. But relax your hangry faces, calm your rumbling stomachs, because we’ve compiled some great ideas for lunchboxes which will be the solution to all your lunchtime woes. This idea may seem more gone-off than gourmet, but cooking larger portions during your evening meal can certainly pay off time and money wise! Invest in some tupperware (Poundland have a great range) and store your leftovers in the fridge until the next morning. When you awake all bleary-eyed, you can simply reach for a fork and your lunchbox and you’re good to go. This is a great way to save on your electricity bill because you only need to cook once and then eat the leftovers cold or re-heat them in the Students’ Union microwave. Wraps can be as healthy as you like and make a welcome change from those disappointing sandwiches. Add salad, chicken pieces (either meat or Quorn) or roasted vegetables with a bit of mayo to make a great wrap that will fill you up until tea. If you’re stuck for other food items to put in your lunchbox, try buying packs of unsalted nuts and raisins. Packed with protein and fibre, this can be a great snack on the go. As they say, fruit is nature’s candy! 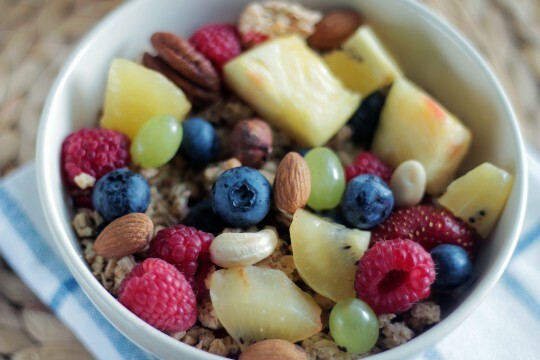 Packed full of vitamins, fruit can be a great way to bulk out a lunchbox. Why not make your lunch more interesting by trying new combinations of food? Bring sliced apple and a pot of peanut butter, which go together really well. If you wet the inside of a sandwich bag and then empty out the water, you can help to keep salad and fruit fresh without it discolouring. Re-use cheap, plastic shot glasses as pots for adding small quantities of condiments such as houmous or the peanut butter for your apple. Add a bit of cling film to the top to secure it. Cereal bars can be healthy (depending on how much sugar they contain) and keep you fuller for longer. You may want to try making your own cereal bar or flapjack. Make a salad more substantial by adding in cous cous, quinoa, or lentils. These kinds of grains will help to keep you full and are much less expensive then you would think. You can buy a tin of soup for under £1, but it is even cheaper to make. Check out some easy recipes here. Fill your flask with a delicious soup to warm you up on a chilly day and bring Ryvita to go with it. Yoghurt is delicious, but some supermarket brands pack their yoghurt pots full of sugar and additives. Opt for a low-fat plain Greek yoghurt to go with your fruit. The ultimate buffet food to make you feel as though every day is a party. Bring carrot sticks, slices of chopped pepper or celery to dip into houmous or low-fat cream cheese. Every now and again you will want to treat yourself, so why not try making some of your own! Chocolate Rice Krispie cakes are a great quick and cheap recipe to make. Melt the chocolate at a low heat in the microwave (checking regularly) and add in Rice Krispies. Stir the mixture and then leave them to set in the fridge. Easy! We hope you’ve found our tips and ideas helpful! Give them a go and let us know what you think by tweeting us @yoursusu.